"""URGENT!!! - CE - AHT - 250-270 USD p/d Position: Chief Engineer Vessel: AHT Salary: 250-270 USD p/d Embarkation: ASAP Duration: 4 months Region: ARAMCO Requirements: - Good English, - 2 years rank experience on same type of vessels. 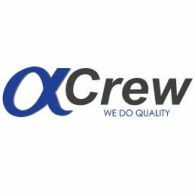 To apply for this position follow this link: https: //my.alphacrew.com/job/5299 email: cv@alphacrew.com Tel: +38048 2 37 19 57 ext. 115"""" Hanna"""